Headlines in the school hallway at Newell Elementary can quickly transport people back to a night nearly 21 years ago in Grand Island. "7 Tornadoes Rip Through Grand Island...Day of Devastation...Terror Island...Meves Bowl Destroyed...The Terrorizing Tornadoes." For long-time residents, those words bring back memories of June 3, 1980, when seven tornadoes struck Grand Island, destroying homes and businesses in several neighborhoods. But for today's fifth-graders, 1980 is ancient history. "After 21 years, a lot of kids don't know anything about the 1980 tornadoes," noted Bill Chadek, Newell fifth-grade teacher. Chadek suspects that is because many parents of his students didn't live in Grand Island in 1980. In other cases, he speculated, parents who lived here then don't talk much about the tornadoes now. Still, the assignment was not intended as a history lesson, Chadek said. "In our curriculum, one of the units is called catastrophe," he said. It covers earthquakes, floods and other natural disasters, including tornadoes. The unit introduced students to a book called "Night of the Twisters" by Ivy Ruckman, a Hastings native. 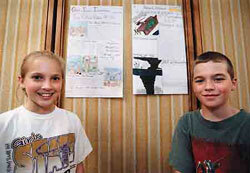 Chadek said his class also viewed a made-for-TV movie about the tornadoes. When he asked students whether they preferred the book or the movie, they responded in unison, "The book!" Chadek and students said the movie took too many liberties with the truth. The movie had either 14 or 15 tornadoes hit the city, not seven. The celluloid tornadoes hit town in October, not June. Ruckman used the experiences of a cousin, Florence Rozendal, and the experiences of several people who lived in Grand Island as the basis for her book. Although Ruckman's book is a fictional account, it still stayed closer to actual events than the film. The students' next assignment was interviewing people and turning those interviews into essays. Jordan Ramsey said she interviewed two people. One was Dawn Splattstoesser, who talked about how Grand Island residents had to go without much water or any electricity for several days. Ramsey also learned how Splattstoesser and others went into the basement and covered themselves with heavy chairs for protection. Brett Rowley said he talked to Fred Tustin, who works for the city's water pollution control plant. Rowley said Tustin explained how he worked to make sure everything worked properly at the plant. However, Tustin also talked about helping deliver sandwiches, chips and water to people at the Veterans Home. Student finally placed their essays into their own re-creations of the June 4,1980, Independent. Chadek said this is the first time he's had students create a newspaper. Students learned other tidbits during their assignment, including that Tornado Hill got its name because ashes from tornado debris are buried there. "I never knew the National Guard came into Grand Island to help out," Rowley added. Ramsey and Rowley said they discovered even more important lessons. Ramsey said she learned it is important to be prepared. That means having flashlights and knowing that when the sirens sound, people should "go down into the basement and go into some kind of room for protection." Rowley said he found out how important it is for people -- not just paid emergency workers -- to help others after a natural disaster.